Does woodchip mulch rob nitrogen from the soil? 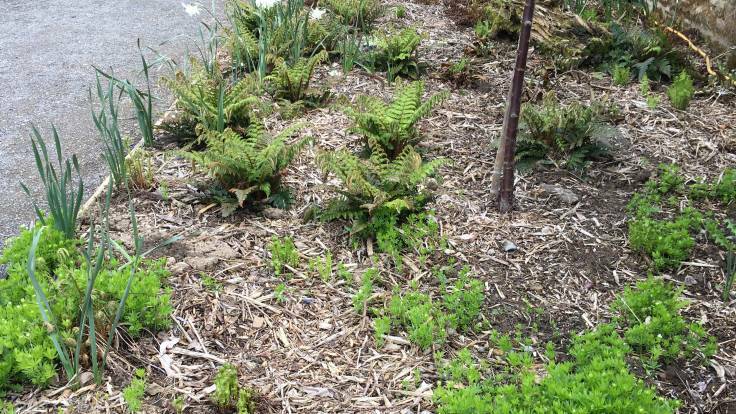 Many people believe that woodchip applied as a mulch around plants can tie-up nitrogen and cause deficiencies. Apparently not! I went to visit a chap called Stefan Cartwright who lives locally and who’s planting up a large site with coppice and a forest garden. He swears by woodchip mulch, and showed me some used on a willow coppicing area, with healthy plants and rich, worm-filled soil underneath. Concern: Wood chip mulches will tie up nitrogen and cause deficiencies in plants. Evidence: Actually, many studies have demonstrated that woody mulch materials increase nutrient levels in soils and/or associated plant foliage. So, it’s fine to use woodchip as a mulch around living plants, although she advises against using it in annual beds where the plants have very shallow and limited root systems. This opens up a lot more possibilities, as I would imagine arborist wood chip is far more readily available than bark. Also, we have a lot of woody material from hedges and general gardening, and it’s far more efficient (and cheaper!) to chip this on-site than to bring in material from outside. This also means that I’ll have more mulching material available so that I can re-use the 1 metre plastic sheet mulch in the coppice and replace it with woodchip. Everyone’s a winner 🙂.